Susan Meyer and I took an 8-day river trip down the Columbia and Snake rivers in Oregon and Idaho during April 25 to May 2, 2018 and then spent four days with her friends Mildred and Lucille in Kendrick, ID. 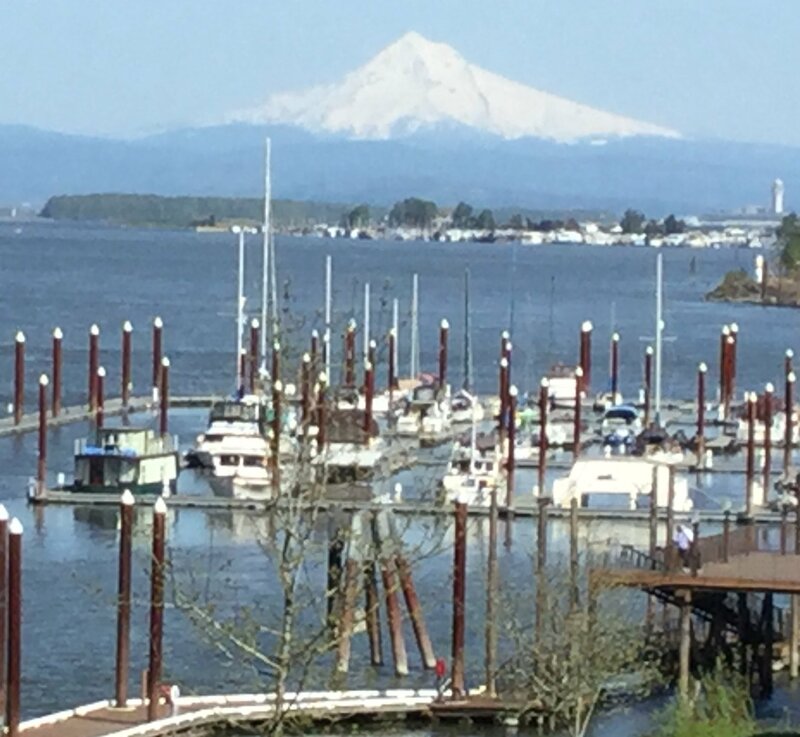 Our river trip began in Portland, OR and went downriver to Astoria, OR and then upriver to Mt. St. Helens, WA, Multnomah Falls, OR, the Dalles, OR, then to Richland, WA and ending at Clarkston, WA right across the river from Lewiston, ID. 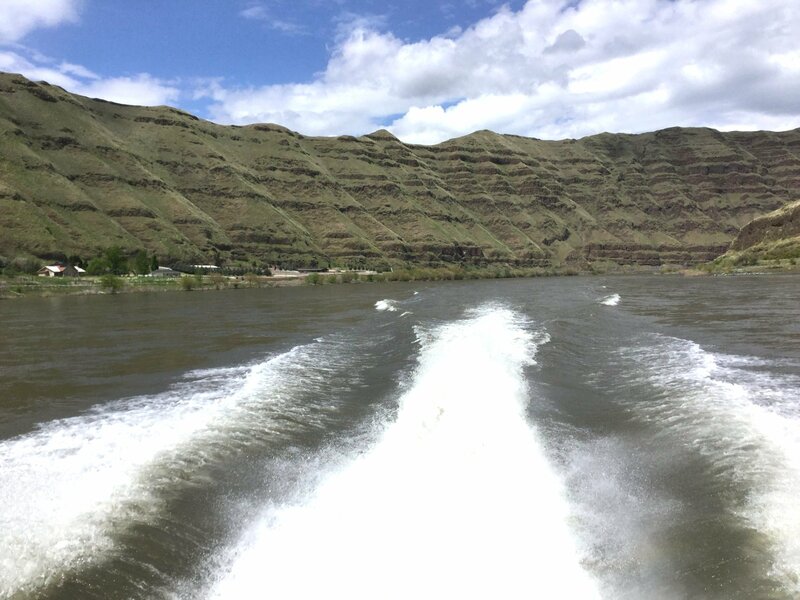 We made stops along the river at each port to go to museums and then went up into Hells' Canyon in jet boats for the last day. 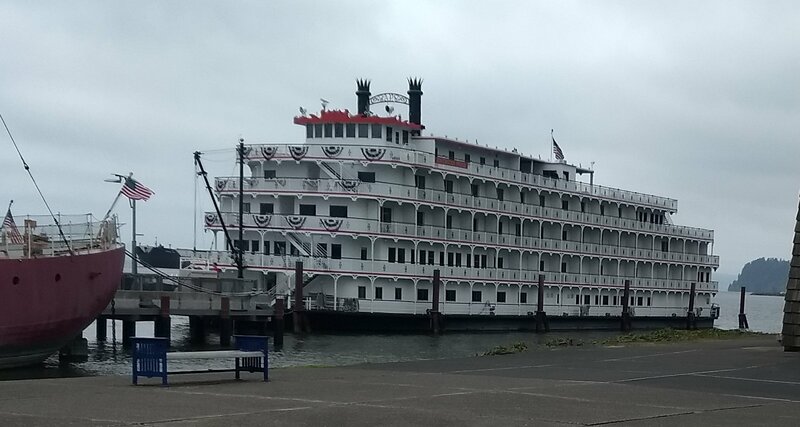 A highlight for me was being on a small river cruise with 135 people on a paddlewheeler with only four decks. Food was wonderful, and plentiful, with much emphasis on fresh salmon and steelhead trout, prawns and crabs and other seafood. We quickly realized we had to choose half portions at every meal and usually skip the first course of soup or salad and the desserts if we were going to be able to walk off the boat at the end of the trip! However, every time huckleberry ice cream was on the menu, we indulged, sometimes sharing one scoop. 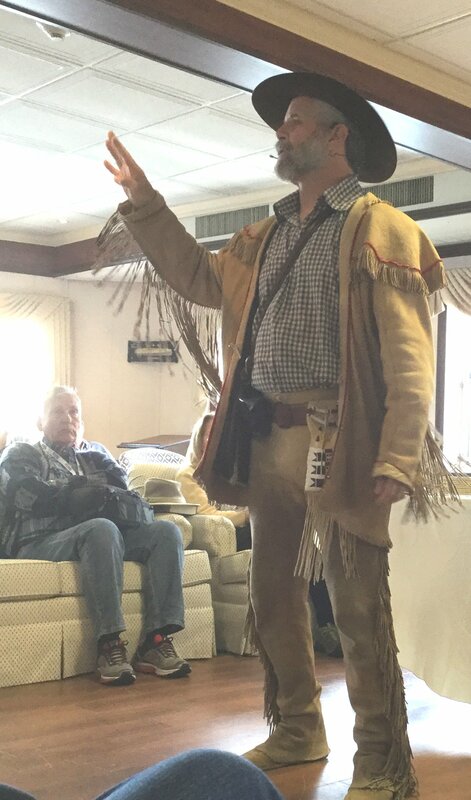 Another highlight was the "riverlorian", Todd Weber, an expert on the Lewis & Clark expedition up the Missouri River, across the Rocky Mountains, and down the Columbia River reaching the Pacific Ocean, returning by a different route. I have a wonderful book: Lewis & Clark, Down and Up the Columbia River by Rex Ziak, that is a unique fold-out guide mapping their journey day by day. Todd's lectures were fascinating and instructive - for example, he'd call four people up in front and give them each a couple lines to read in a different language, to illustrate how Lewis & Clark had to translate to talk with the Indians. Sacagawea, who had been captured from the Shoshone Indians by the Hidatsa, spoke a little Hidatsa to communicate with her husband Touissaint Charbonneau, a French Canadian trader who had lived among the Hidatsas for four years. He did not understand English. 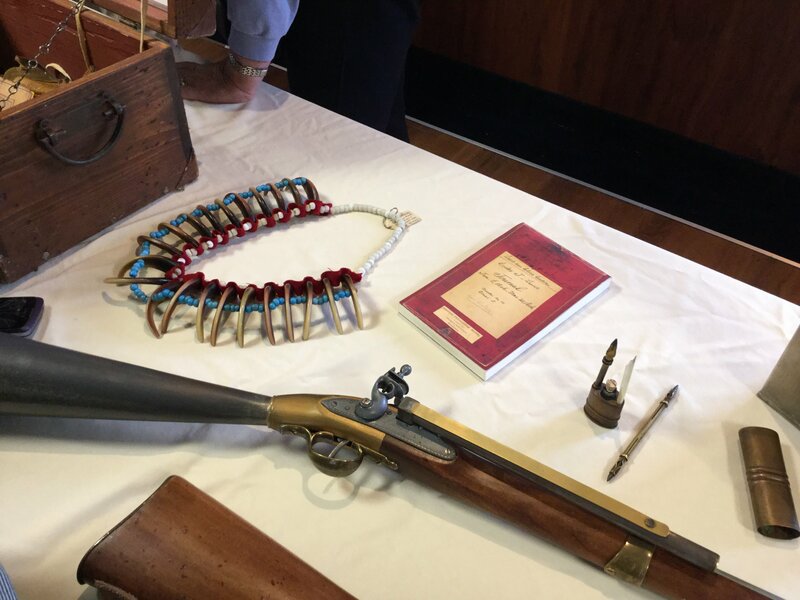 He could speak French to Jessaume Drouillard, "who spoke bad French and worse English and served as interpreter to the captains. Thus a single word to be understood by the party required to pass from the natives to the woman, from the woman to the husband, from the husband to the mulatto (Drouillard) and from the mulatto to the captains." Undaunted Courage, p. 187. 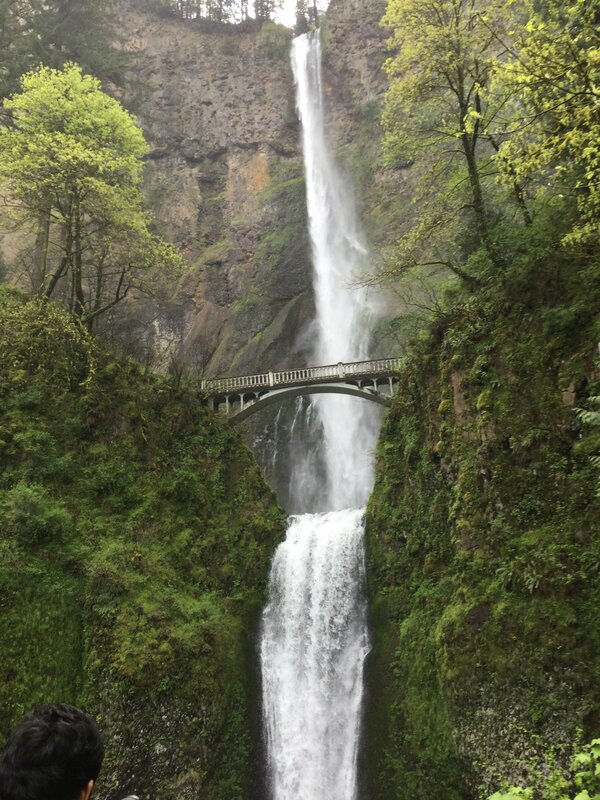 Multnomah Falls, the highest contiguous falls in the United States, was awesome.Establature, pillow and columnar basalt can all be found in the layers behind the Falls as liquid basalt transformed into rock, the type of basalt depending upon its environment and cooling rate. The Falls were created when a massive flood scoured out the Columbia Gorge, leaving the Falls to "hang". The museums were all wonderful, and dealt with the fishing history of the Columbia River and with the history of the Indian tribes who lived near it. I've put a list of links to some of them at the end of this report. 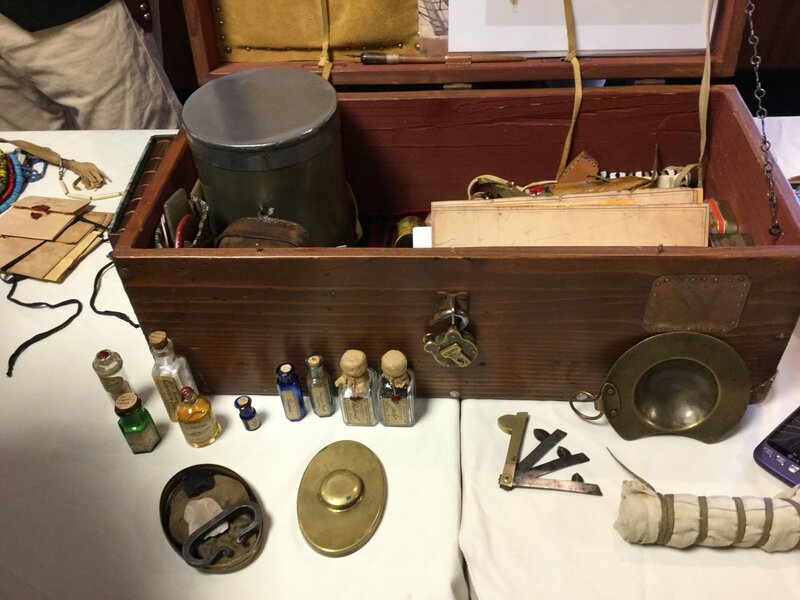 They had interesting exhibits of fishing boats, recordings of fishermen from the late 1800's and early 1900's about their experiences fishing for what were then HUGE salmon (120 to 150 pounds). Other museums farther into the Gorge, such as the Columbia Gorge Discovery Center in the Dalles, had extensive collections of Indian clothing and exhibits about their lifestyles including what they ate and how it was gathered and prepared, to what they wore and how it was made, and how they traveled in summer and winter. The Hells' Canyon jetboat ride was fascinating: there are very few homes or ranches as you go further into Hells Canyon, and jetboats are the only boats other than kayaks that can navigate the shallow and rocky water; the boatmen really need to know how to follow the channel which switches from side to side as you go further up into the Canyon. We stopped for lunch at a small ranch that is now a Nature Conservancy site; it is a four-hour drive from Lewiston, ID over a one-lane road at the very top of the canyon; everything must be brought in by small truck or cars with small trailers. Hells Canyon is green all the way to the top interspersed with solid rock columns with occasional Indian pictographs from the Nez Perce tribe who camped along the Snake River in the Canyon. We had a wonderful, relaxing time with Susan's friends Mildred and Lucille, who live in Kendrick, ID where Mildred's parents lived. They are both Ph.D. biology and botany professors who taught at Ithaca College in New York for many years and then retired, Mildred to move back to where her parents had lived, and Lucille to Florida where her parents were. Lucille just moved to Kendrick to keep Mildred company last fall. Lucille says she was getting tired of Florida: too many people and too much traffic down the one-way dead end near the beach where she lived. Mildred's macular degeneration means that she is having trouble seeing to drive at night. Mildred says Lucille was becoming "forgetful". Susan and I think they need each other! We had a very nice lunch in a restaurant attached to Coulter's Creek Winery in the tiny town of Juliaetta, ID and met Joanie there, Susan's other friend from high school who now lives in Troy, ID just up the road. 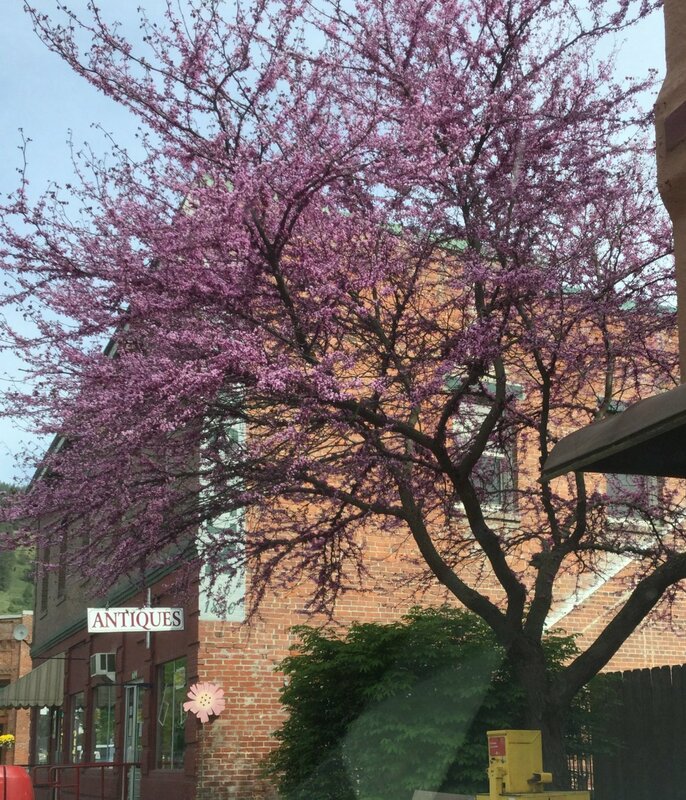 Susan was born in Orofino and knows Mildred and Joanie from grade school and high school there; Mildred worked at the newspaper offices in summers when she was home from college and Susan worked there after class during high school. 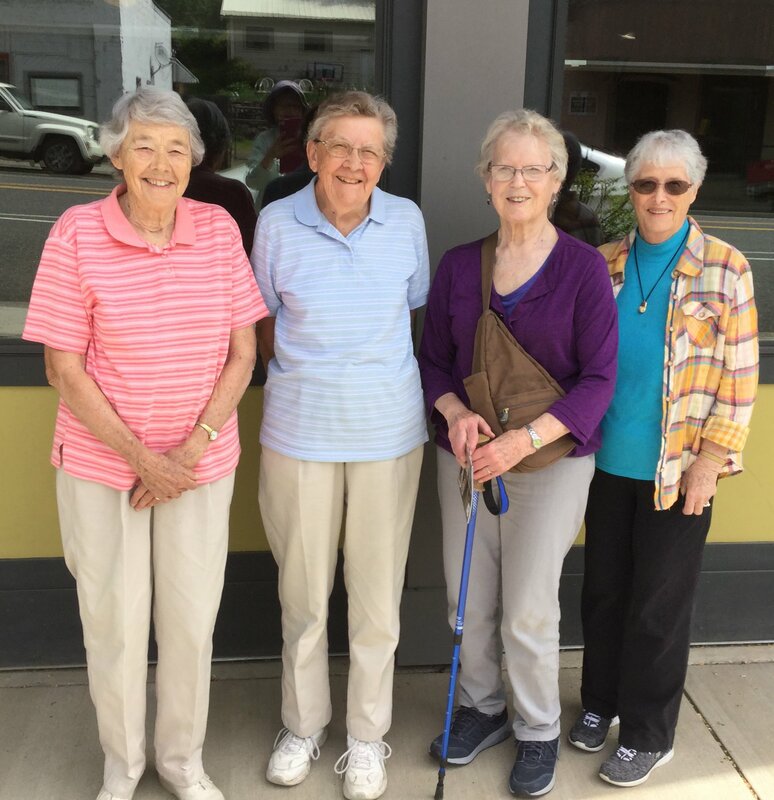 They have wonderful shared memories of people and places from their years of going to school and working together and have always kept in touch. We also enjoyed visiting the Nez Perce National Historical Park Museum and Visitor Center in Spalding, ID. The Nez Perce are the Indians who kept the Lewis & Clark party alive after their passage across the Rocky Mountains - 29 men, an Indian woman (Sacagawea) and her baby, and a Newfoundland dog, Seaman. The party was starving to death and reduced to eating their horses to survive. Later, Lewis & Clark would leave their own pack horses with the Nez Perce for safekeeping until they returned on their trip back home. They launched their five canoes on October 7, 1805 for the more than 500 mile voyage down the Columbia River to the Pacific Ocean. 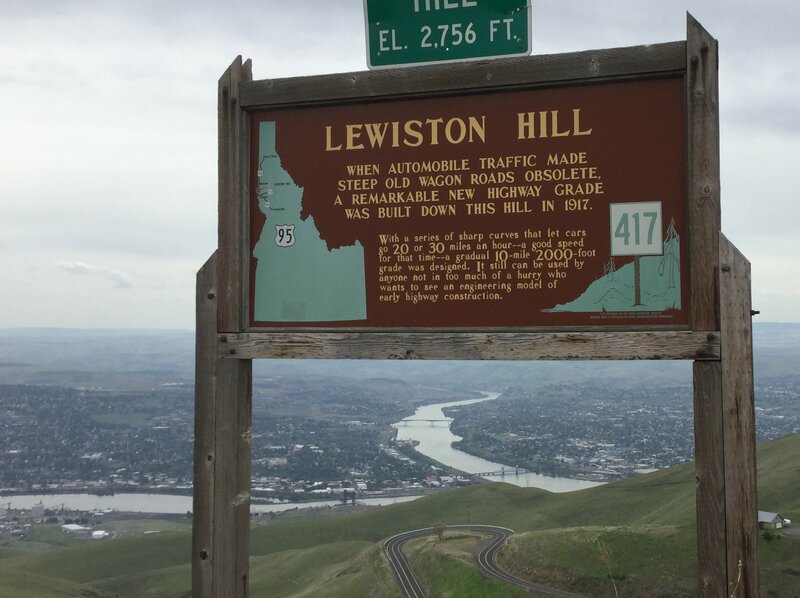 The town where Susan grew up, Orofino, is where the Lewis & Clark expedition was around September 24-25, 1805, before they left the Nez Perce. We took a day trip there the last full day at Mildred & Lucille's; Susan showed me around town, where they lived and where she worked at the newspaper office during high school and her first year of college in the summer. Then we drove to Moscow, ID on the "Palouse", the high rolling plains of Idaho with miles of fields of grain. We found a great restaurant and a Farmers' Market. We bought fresh asparagus for Mildred and Lucille and I bought wonderful photo cards of the Palouse and some Marionberry jam. If they'd had huckleberry I would have bought that since Susan and I enjoyed the huckleberry ice cream so much on the boat nearly every night! Then Susan drove me around the college campus so I could see where she and Don lived after they were married and where she attended classes. It was really interesting to hear about her earlier life (before Duluth!) and about her and Don's various adventures - working as a fire lookout in the forests in the summer and living and working in Jackson Hole, WY after college. All in all, this was a very wonderful trip with a lot of longterm memories and many, many thanks to Susan for inviting me and making it possible for me to join her!